Smart devices are seeing greater and greater use on the business scene, but procedures for connection to office equipment are complex and still by no means stress free. 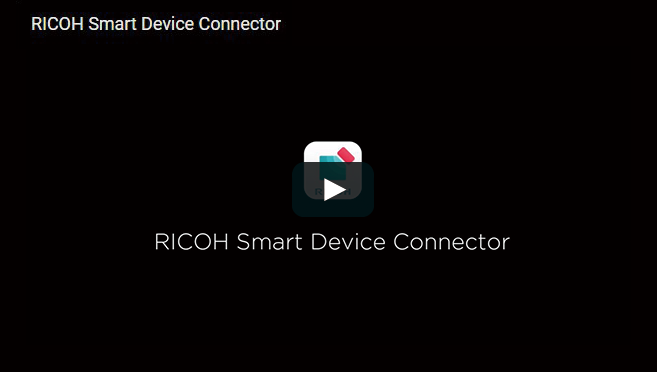 With RICOH Smart Device Connector those complex procedures become simple, and you can seamlessly connect to various devices. You can operate a multifunction product by just holding the smart device over it, and you can operate a projector or electronic whiteboard by just reading a QR code. The data made available via the connection of a smart device with other devices will support quick decision making and a high level of value creation. Get started immediately by just downloading a free app. Your everyday working environment will become a more creative place. 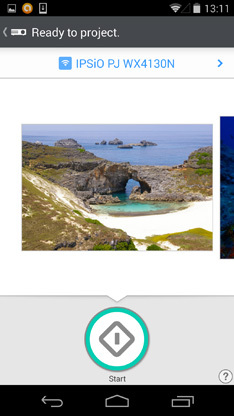 You can print photographs and documents stored on smart devices and in cloud storage. * This is convenient because the settings can be made with the smart device and the printing can be done directly by the multifunction product, all without using a PC. 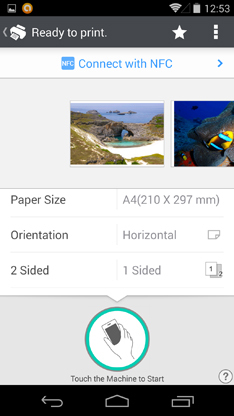 Use this capability when you want to hand out documents or photographs, and when characters are too small and difficult to see on your smartphone screen, by simply printing them out to get a better look. 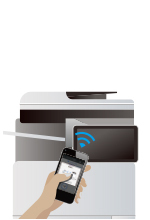 In the same manner as when printing from a PC, you can specify number of copies, b/w or color, paper size, etc. In addition, the security features mean that you don't have to worry when printing confidential materials. 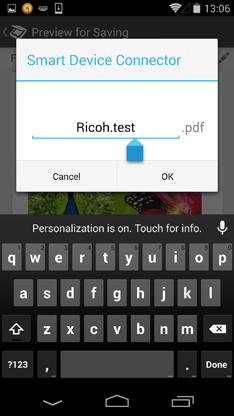 * To use the printing functions, it is necessary to install RICOH Smart Device Print&Scan (Android: version 2.3.7 or later, iOS: 2.3.10 or later). 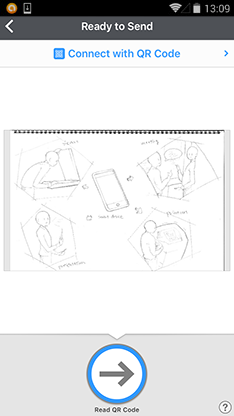 After scanning paper documents on a multifunction product, you can directly save the data on a smart device and in cloud storage so it can be viewed anytime and anywhere. 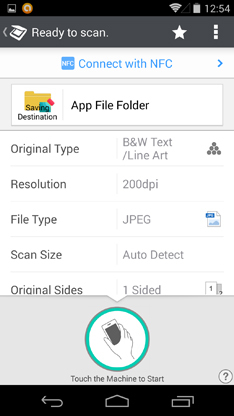 Settings such as file format, resolution, and scanning size can be specified. In addition, it is also possible to send the scanned data (via the multifunction product*) to an email address designated in the smart device address book. *It is necessary for the multifunction product to be connected to a network. 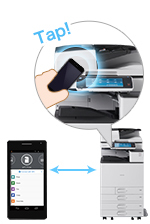 It is also possible to make copies by performing operations on a smart device. 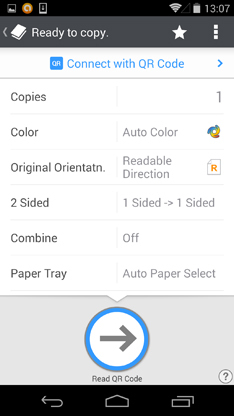 Copy settings (number of copies, b/w or color, simple or duplex, etc.) can be specified, and you can save frequently used settings as favorites. 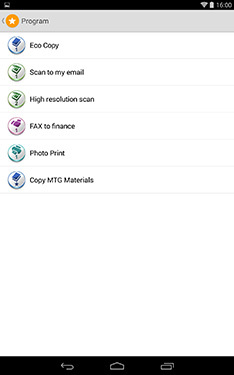 Specifying the settings on a smart device, faxes can be sent (via the multifunction product*) to fax numbers designated in the smart device address book. 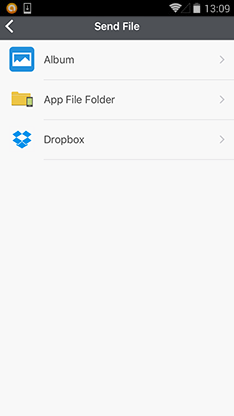 Settings such as document type, resolution, and paper size can be specified. *It is necessary for the multifunction product to be connected to a fax line. 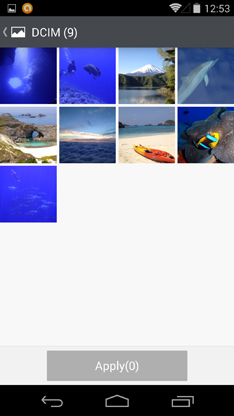 The data stored in a smart device and cloud storage can be projected to a bigger screen with File Projection function. It is also possible to project the data scanned from a multifunction product. Sharing paper documents in a meeting will be easier with this funciton. 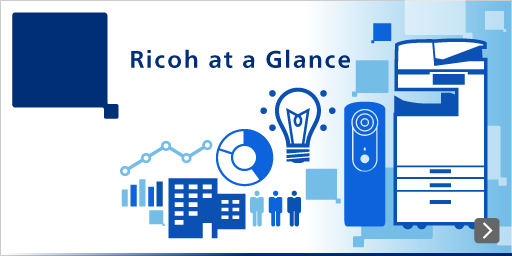 You can access data on devices and in cloud storage and display it on the RICOH Interactive Whiteboard. Of course, you can also handwrite discussion content on top of that data. When the meeting is over, you can upload the annotation data to the smart device or cloud to facilitate intelligent post-meeting follow-up. This is a wireless connection that makes it possible to reduce the burden of procedures for IP address/host name entry and QR code reading. *2 RICOH MP C306 and RICOH MP CW2201/CW1201 only. * Print data and scan data are sent and received using Wi-Fi. * When BLE is used, it is necessary to turn the smart device Bluetooth setting on. If you have an NFC-equipped Android device, by just touching the multifunction product, you can easily connect to it without having to perform any troublesome equipment registration in advance. Complete the connection by just touching the Android device on the NFC tag* attached to the multifunction product operation panel. *A data write operation needs to be performed in advance by the device administrator. 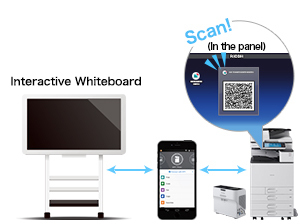 By just scanning with your smart device the QR code displayed on the multifunction product operation panel, the screen, or Interactive Whiteboard, you can easily connect to it without having to perform any troublesome device registration in advance. *There may be cases where the QR code does not display due to the security settings of the multifunction product. If that happens, please contact the administrator. You can make direct use of information in your smart device address book. In the case of a scan, it is possible to send the scanned data (via the multifunction product*1) to an email address designated in the smart device address book. 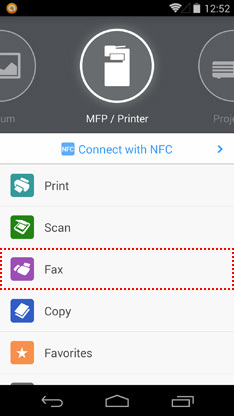 In addition, faxes can be sent (via the multifunction product*2) to fax numbers designated in the smart device address book. By putting to use information already stored in your smart device (contact list), you can utilize multifunction product in a smarter and more efficient manner. *1 It is necessary for the multifunction product to be connected to a network. *2 it is necessary for the multifucntion product to be conncected to a fax line. Carry your personalized function settings with you by saving them on the smart device (Favorite function). 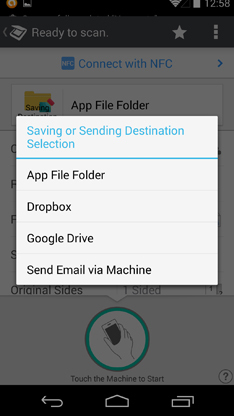 Since the saved favorite can be easily activated, the effort required making setting changes each time is eliminated. Using the Wireless Direct function on the "Smart Operation Panel", it is possible to transmit directly between a multifunction product and a smart device*. With this function, the smart device can be directly connected to the multifunction product without connecting to a network. It is also possible to select the method of connecting via a network accessed from an office wireless LAN access point. * The availability of wireless direct function differs depending on countries and areas. -"," will be replaced by "-". 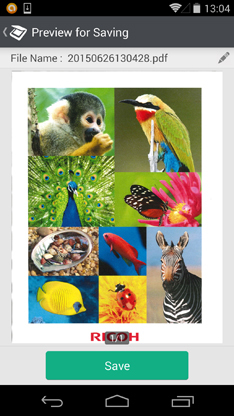 -All characters that cannot be used in Ricoh Fax will be removed. *1 If the smart device is set to display a language other than those shown, English will be used. *2 In the case of languages that use right-justified text, there are places where the display text is not right justified. *3 Only models with Smart Operation Panel. Also, when using a Wireless Direct connection, device registration cannot be done on the app. Projectors and RICOH Interactive Whiteboard are not supported. *4 Device connection using Bluetooth® can only be done by models with Bluetooth® functions. Projectors and RICOH Interactive Whiteboard are not supported. The smart device must be a terminal and have an OS with Bluetooth® Ver. 4.0 or later. *5 Please see the Models supported. *6 For the search for devices on the same subnet, the device and the smart device need to be connected to the network on the same subnet mask.RICOH Interactive Whiteboard is not supported. *7 The LF servers are: Ricoh LF print server AE2 and Windows® shared print queue. Windows® shared print queue cannot be resident together with the domain controller. 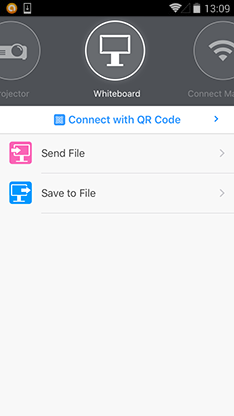 Bluetooth and QR codes cannot be used for output after print data is sent to the LF server. *8 A separate cloud storage service contract is necessary. *10 Depending on the app, there may be cases where a link is not possible. 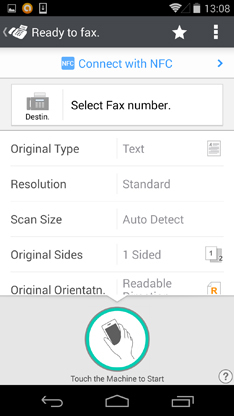 *11 There are cases where the connecting device needs to have an option for fax use. Paper document fax transmission only. *12 Video projection is not possible. 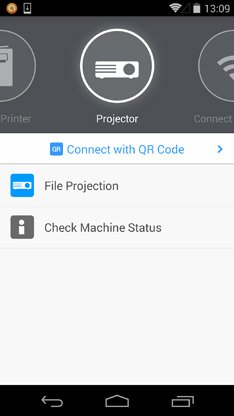 *13 QR codes can only be printed on printers that support this app. *The models supported for output from the supported software correspond to the models supported by the individual software product. Please reference the site of the individual software product. 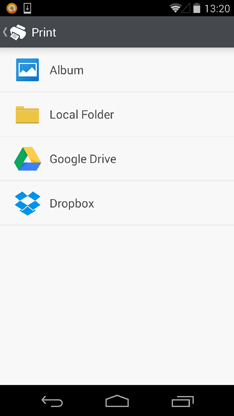 *Among Android devices, those that cannot download and install software from GooglePlay cannot be used. *Cable connection from a smart device is not supported. *Some functions require the latest version of the software. Download directly from the App Store using your iPhone or iPad device. 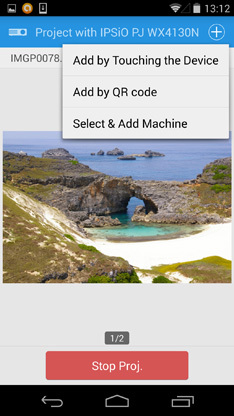 Download directly from the Apps section on the Google PlayTM. *Apple, the Apple logo, iPhone, and iPod touch are registered trademarks of Apple Inc. in the United States and other countries. iPad is a trademark of Apple Inc.
*Google, the Google logo, Android, the Android logo, Google Play, and the Google Play logo are the trademarks or registered trademarks of Google Inc.
*Other company names and product names are, as a general rule, the trademarks or registered trademarks of their respective companies.